The proliferation of wireless gadgets overlooks a critical health issue: non-ionizing or microwave radiation at levels that do not induce measurable changes in temperature can change and damage the brain and sperm of experimental animals. A cellphone is a two-way microwave radio with intermittent and destabilizing pulses, unlike microwave ovens that steadily operate at the same frequencies at much greater power. The weak and erratic microwave radiation from cellphones and tablets cannot directly break the bonds that hold molecules together, but does disrupt DNA, weaken the brain’s protective barrier and release highly reactive and damaging free radicals. A 5 year old’s brain, healthy or otherwise, is encased in a thinner skull and contains more fluid than an adult brain. According to studies carried out by industry modelers in Switzerland and France, the bone marrow of a child’s head absorbs 10 times more radiation than an adult, while that of infants and toddlers will absorb even more. Few parents realize that infant apps such as One Fish Two Fish, Peekaboo Farm, and Twinkle Twinkle Little Star may do much more than amuse and distract babies. The American Academy of Pediatrics cautions that children need more real face time than screen time; more laps than apps. The brain cancer story remains complex, because the disease has a long latency—up to four decades—and because past uses and users differ radically from current ones. When it comes to using electronic devices, remember: Distance is your friend. Don’t hold a cell phone directly up to your head. Use a headset or speakerphone to talk on the phone, or a case (such as Pong) that has been independently tested to reduce radiation up to 90%. Don’t allow children to play with or use your cell phone. Older children should use a headset or speakerphone when talking on a cell phone. 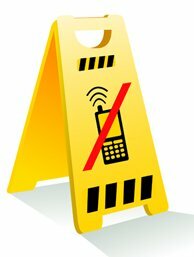 Do not text and drive, and use specially adapted antennas for cars to avoid absorbing maximum power as the phone moves from one cell system to another. Devra Davis is the founder of the Environmental Health Trust, an organization dedicated to providing basic research and education about environmental health hazards and promote constructive policies locally, nationally and internationally. Dr. Davis lectures at Georgetown and Harvard, and is the Founding Director of the Center for Environmental Oncology and University of Pittsburgh Cancer Institute. Her new book Disconnect (selected by TIME magazine as a top pick) provides shocking detail about cell phone radiation and your health.